Victor Burgin, UK 76 (detail), 1976, archival pigment print, 40 x 60''. Victor Burgin premises his art on misalignment. His early work commutes among image, narrative, and theory, pleasuring in the friction among disjointed forms of meaning. Exemplary from this period is UK76, 1976, a suite of eleven black-and-white photographs of workaday scenes: a supermarket, a sidewalk, a factory. On display at Bridget Donahue as a pendant to two digital projections at Cristin Tierney— Mirror Lake, 2013, and Prairie, 2015—each photograph is contoured by text cobbled from structural Marxism, promotional copy, and Burgin’s own aphorisms. Pasted directly to the wall like street advertisements, these composites of image and glyph anticipate their own disuse. Their presentation upends our sense of space, bringing the gallery’s outside, inside. We especially feel this in Burgin’s extensive suite of books, from Between (1986) to Some Cities (1996), where excerpts from UK76 appear. Such locational drift befits Burgin’s mode of ideological critique, which finds meaning not behind representations but between them, spaced by layers of allusion that disallow any stable authorial position. Consider the depiction of a working-class suburb in one of the images from UK76. Captured in straight documentary style, the photograph reports an asphalt landscape where anemic plots of grass preface nondescript homes. Two pedestrians interrupt the scene, like the umbrella-bound figures of Gustave Caillebotte’s Paris streets, indifferent to one another’s presence as well as to the dog in the foreground. A gloomy sky expresses the mood as clouds slouch over power lines and taper into the composition, calling to mind the conventions of one-point perspective. Yet while perspective aims to construct a coherent pictorial space, Burgin’s textual overlay, either a quotation or a parody of an exotic travel brochure, dislocates the scene. 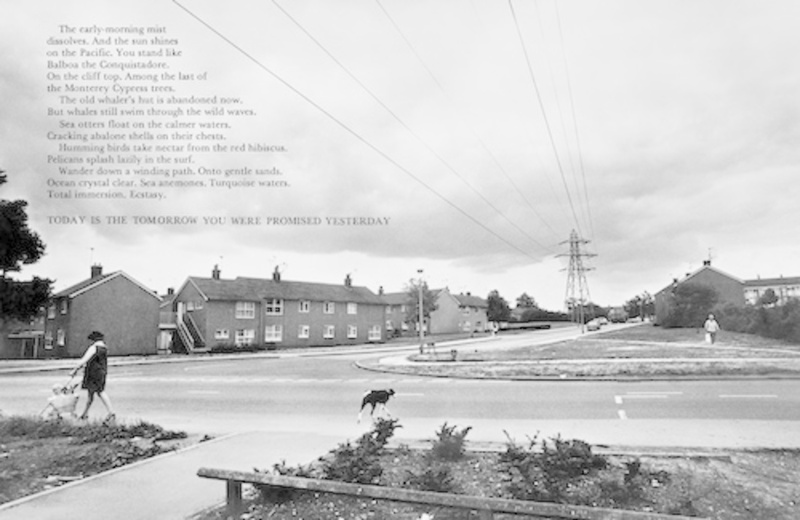 Couched in all-caps, its closing line—“Today is the tomorrow you were promised yesterday”—grafts present and past onto a counterfactual future. Looping fantasy and reality, the work attests to Burgin’s expanded understanding of the image as a phenomenon whose implication in discourse and desire exceeds the strictly visual.